How Jona got her groove back? - Stop staring and start sewing! How Jona got her groove back? The winner of Friday's Pink Fig Patterns give away is Allison, who left a comment at 7:05 pm on 5/22 (yes, you Allison!). Oh, and I wanted to share one more nice thing that happened as I was leaving Quilt Market. Remember how I was on the same plane as Kaffe Fassett going to Pittsburgh? Well I was just getting seated on the plane headed home when Erin McMorris boarded. I met her at market and she is truly a sweet person (I know! Another one!). I wish she had sat next to me but she's probably glad because I would've talked her ear off for the next 5 hours. We rearrange this space just about every two months so it will look different in a couple of weeks because my son just finished his school year and I'm not homeschooling him next year so we've kicked him, and his stuff, out of my office. I'm setting up my sewing space in there next to my desk. 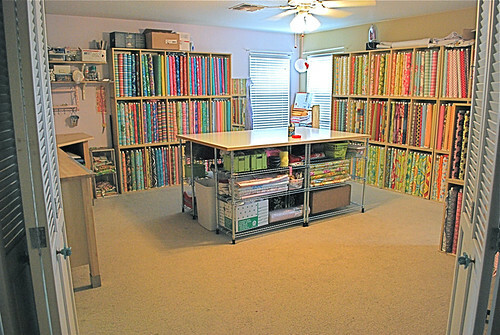 That gives us room for more shelves which means...more fabric! And since I spent like a drunken fabric sailor on furlough while I was at market, I'm going to need it. If you ordered fabric last week, we are all caught up now. I'm sorry for taking longer than usual to get things out but between the post market rush and the sale it got a little crazy around here. Thank you for being so patient! Okay, I know you're totally tired of me giving stuff away but unfortunately tomorrow is the blog give away on Sew Mama Sew. So you need to go over there tomorrow and follow the links to all of the blogs that are giving away goodies (finished goodies, and non-finished goodies). And if you have a blog you can join in and give something away (the guidelines are listed there in that post). And that's the last of my give-aways, honest! Well until next month when I celebrate Fabritopia's first birthday. Yay!